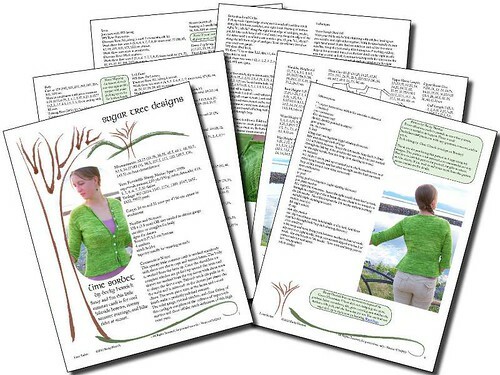 Just head over to Ravelry and favorite or queue any of my for sale patterns. That’s it! 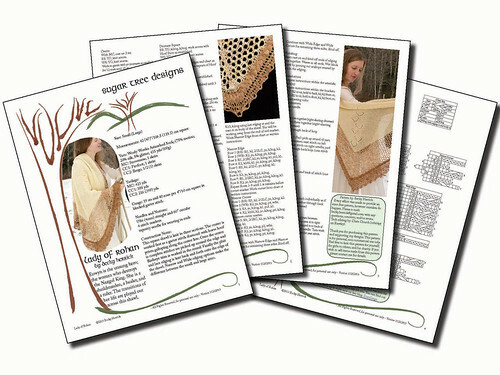 Every day I will use a random number generator to pick one lucky winner and I will send them the PDF for the pattern they chose. – I will count entries from 12:00am to 11:59pm as they’re sorted in the activity tab. I think that’s eastern time. 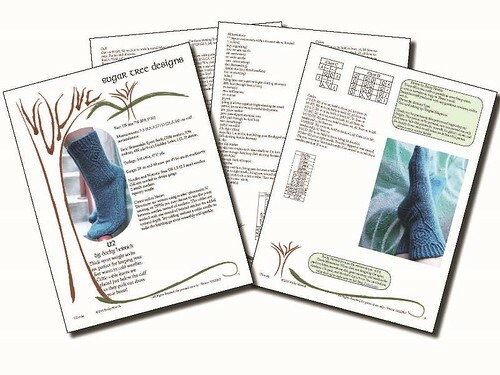 – I can only give away single patterns I’m selling through Ravelry myself. That’s these ones here. None of the patterns through third party publishers like Twist Collective or Cooperative Press count. – Favoriting or queuing a free pattern doesn’t count as an entry, because I wouldn’t know what to gift you. You can still favorite or queue them, if you want! – I will keep track of who wins each day. I want to spread the love around so everyone can only win once. You don’t have to stop favoriting and queuing things though, if you’re lucky enough to get pulled again I’ll just generate a new number for that day. 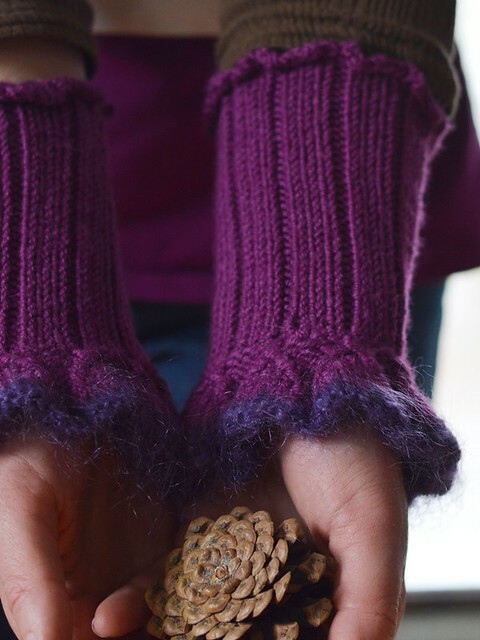 – Yes, you need a ravelry account to participate. But it’s free to sign up, if you haven’t yet. And you should, because favorites and queues are an awesome way to organize the patterns you want to knit! – You can re-favorite or re-queue things. If you already have all my patterns on your list that doesn’t disqualify you. Feel free to un-favorite them and then re-favorite them. If you favorite AND queue something in a single day you’ll be entered twice. If you favorite and queue EVERYTHING I have every day that’s 90 entries a day. – I reserve the right to have a life. What I mean is I might not get around to sending a freebie for a day or two, but I will go back through the activity feed and pick winners for each day. Any other questions? Leave them in the comments. We’ve been having a bit of a conversation in the naknimitmo group regarding color work and yarn dominance. If you’ve never heard of yarn dominance the basic idea is that the stitches made with one yarn stand out more than the other based on how you’re holding them. Yarn dominance only comes into play when you’re knitting with two strands and it only matters at the edges between the two colors. But when it matters it can matter a lot. You can also hold one in each hand. Since I don’t knit continental I find this slows me down although it’s a pretty good trick when I want to knit with three colors in a single row. But no matter where you hold the yarns or how you knit the dominant yarn is the one closest to the fabric and this makes the stitches just slightly bigger. 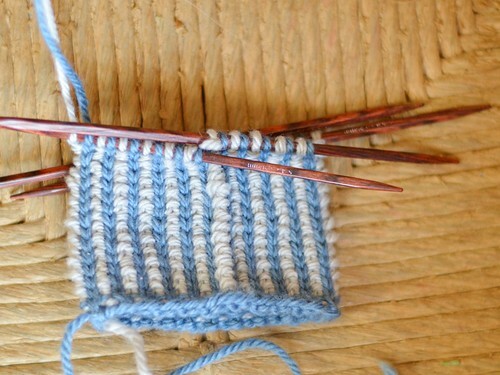 If you’re looking at your hands and you still can’t figure out which is dominant my suggestion is to knit TWO gauge swatches. I know many knitters dislike them. But there’s really no better way to see how much yarn dominance is going to affect your knitting than to try it out. Any time one stitch is surrounded by a sea of the other color, or you have a diagonal line of single stitches, or little curlicues, or anything like that and you usually want the motif yarn to be dominant. 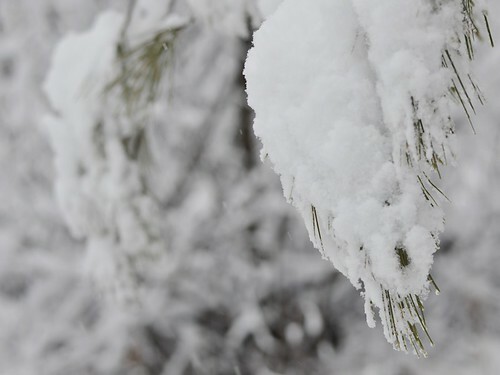 That’d be whichever color your using for the flecks, lines, curlicues, flowers, and snowflakes. See how much happier everything looks? The knits are coming forward just as they should. The purls are happily receding. So even though I’m using the white yarn as the dominant color in the hand of this mitten it needs to be recessive in the cuff. Sometimes I learn these things the hard way. Hopefully you can learn from my mistakes so you don’t have to make them yourself! Marcie was my coworker. She was also my friend and a really good knitter. She wouldn’t have said as much but I’ve seen the proof. She would tackle any pattern regardless of the skill level and would just learn what she needed on the fly. Cables, sock heels, short rows, entrelac… She even taught herself to knit right to left for entrelac because she’d read it would go faster that way. She wasn’t afraid of crochet trim or of frogging. 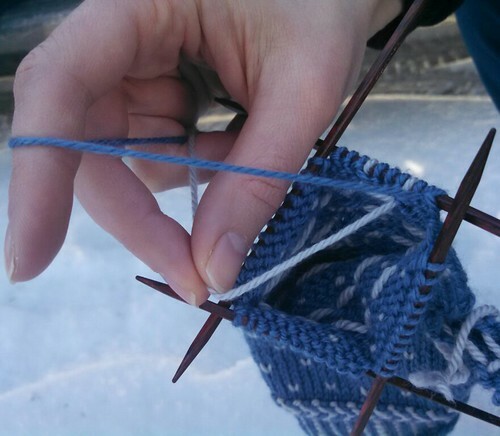 She was willing to pull the needles out of her work any time it was necessary to fix a mistake. She and I would sit together in meetings with our knitting. It was great to have the company. Almost two years ago she died suddenly and unexpectedly. She didn’t have any valuables at work and her family didn’t want anything from her office. No one had gone thorough and cleaned up until this month. Afterwards my boss gave me these wrist warmers. Nothing too fancy, although the beads on the green are pretty. They’re a combination frilly and functional. 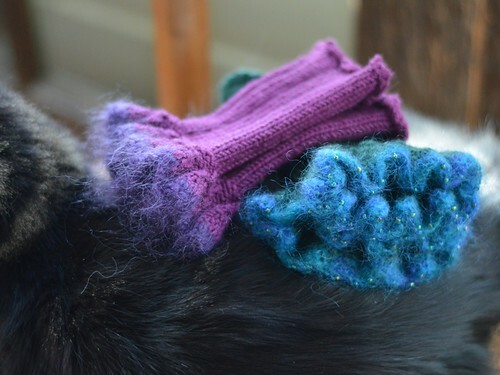 Which is one of the things I love about knitting. Someone at work suggested I could “pull the yarn out” if I wanted to reuse it. I know Marcie wouldn’t be offended by that idea. But there’s no way I could do that. Instead I will wear them, use them, keep them as a physical memory of her until they’re worn out. 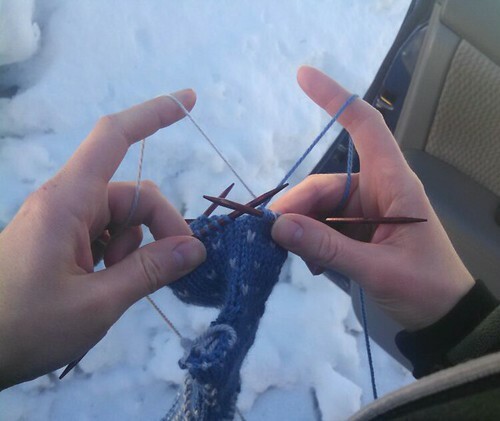 Because that’s what knitting is meant for. 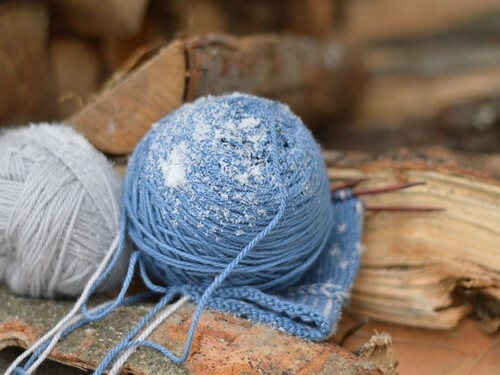 Do you have any knitting with special memories worked into the stitches? 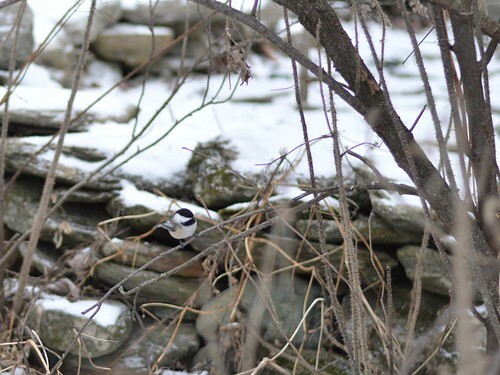 January is the dark gray heart of winter. If nothing else it’s a great time for knitting, so here’s what is on my needles. Actually, these are just the active projects that live downstairs, next to the couch. And/or that travel with me to work. There are a couple of things hibernating in the craft room which aren’t too far gone. Hopefully we’ll visit some of them soon! 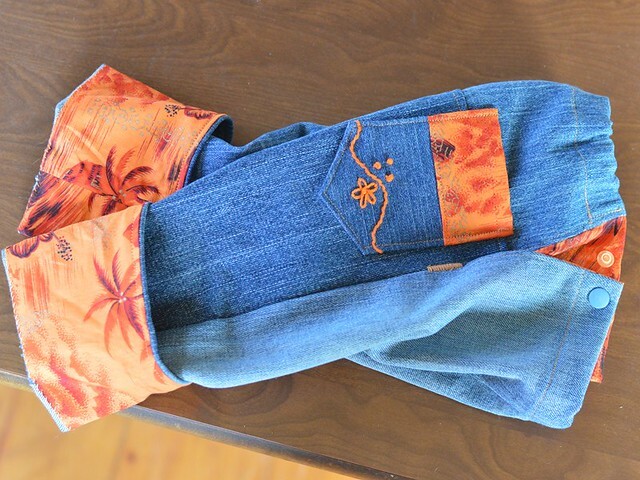 Two color cuffs and hands with a lined cuff. These are in the ridiculously soft Yellowstone yarn from my distributor, Stitch Sprouts. 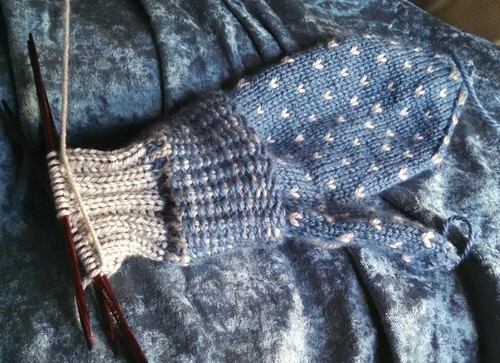 The first mitten is done now, and I’ve just cast on for the second. Three color socks. You may remember these are mom’s Christmas gift. Possibly they’ll be a mother’s day gift… We’ll see how they progress! I swear gussets take FOREVER. I think it’s a mental block. I want them to go quickly, like the other parts of the heel. 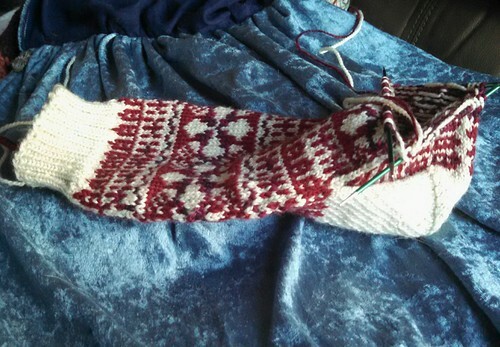 But the gusset is actually all those extra heel stitches PLUS all those foot stitches. 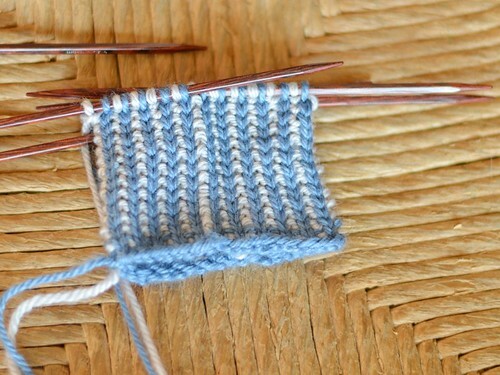 By the time you’re finished with the gusset you’re half way done with the foot. I know this conceptually, but they still feel like they’re taking FOREVER. And I’m balancing all that stranded color work with some stripes and cables in this Camden sweater. It just needs a second sleeve, and a hood! One thing about this baby is she’s keeping me busy! And sometimes that means even too busy to blog. 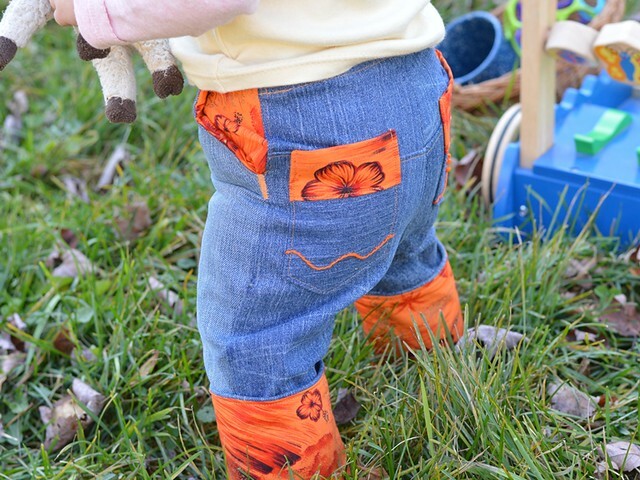 Which means I never showed you the finished beanstalk britches I made! They turned out perfectly, but very nearly didn’t turn out at all. I reclaimed denim from a pair of old jeans. And in the first steps I managed to cut out 3 right back pieces… I didn’t have enough denim in a matching color to try again. Or at least I didn’t until Neil sacrificed a too small, but otherwise perfectly good, pair of pants. The brilliance of this pattern is the series of snaps in the waistband combined with the turned up cuffs. 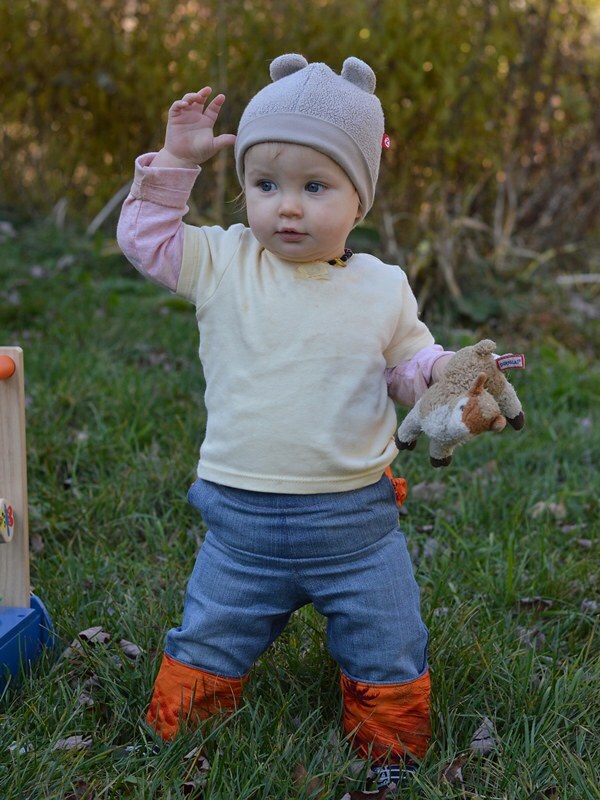 This pair is size 6-24 months. With any luck my stitching will hold up that long! The last two weeks have been a whirlwind of car troubles. Actually, troubles with two cars, so Cars Troubles – plural on both. I’ve been driving a reliable old beater for years. Except somewhere over the last year it became slightly less reliable. Most recently the check engine light came on, and the code read as something expensive. So when my sister offered me a hand-me-down car I jumped at the chance. When we got it home it was a comedy of errors, check engine light but no good reason, brakes failed, then came back, and the mechanic couldn’t figure out why. Clutch needs to be replaced. I switched back to my reliable old beater. Yesterday that car died on the side of the road. * And so now I’ve switched back again to the hand-me-down car. I hate cars. So why am I telling you all this? 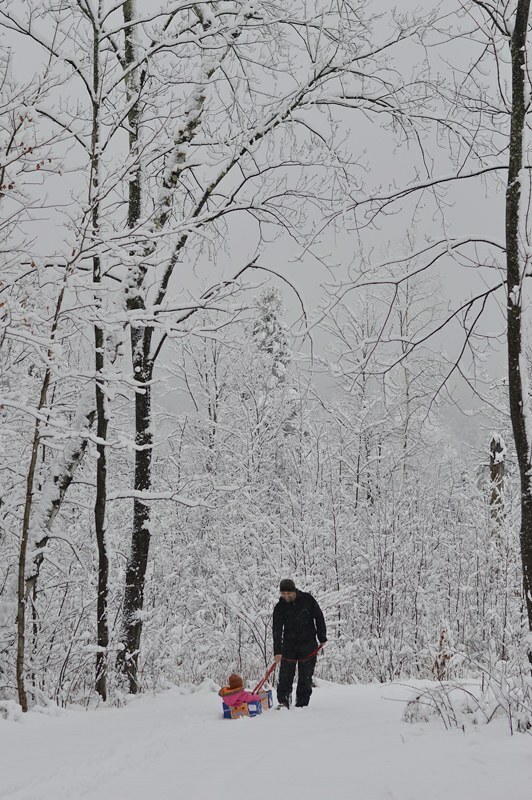 Sometimes I worry that this blog is becoming too picturesque. 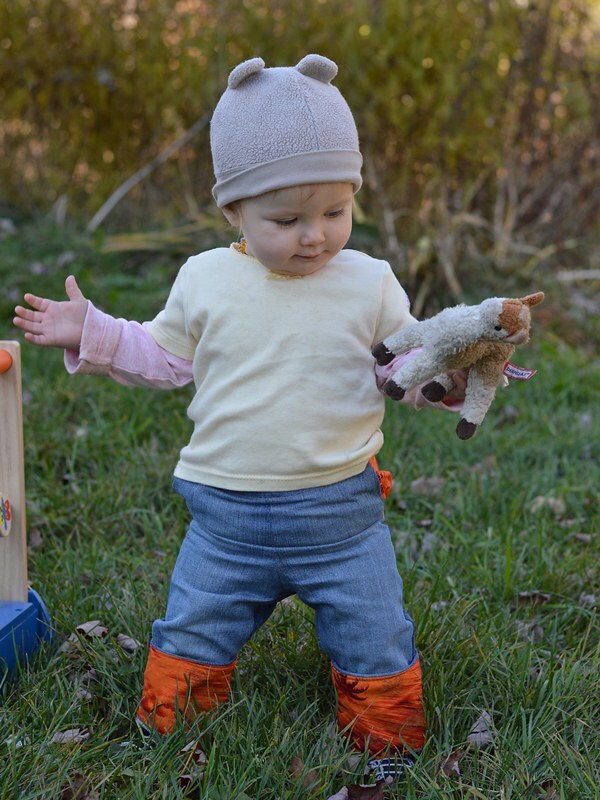 It’s all adorable toddlers, perfect knitting, and snowy landscapes. But life isn’t like that. Sometimes a car breaks down in that snowy landscape. Sometimes that adorable toddler won’t sleep unless she’s literally on top of one of her parents. Even the knitting gets frogged occasionally. Nothing is perfect. Let’s all embrace the imperfections. Maybe I will be able to laugh about this car thing in a couple more weeks. Feel free to leave a comment about what’s gone off-rails around you recently. It helps to get things out in the open sometimes! 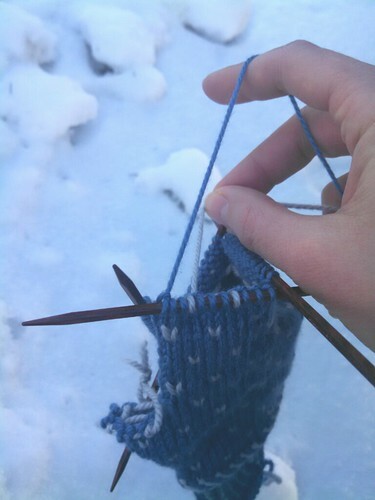 I knit the whole cuff of my most recent mittens with the dominant and recessive yarns backwards. 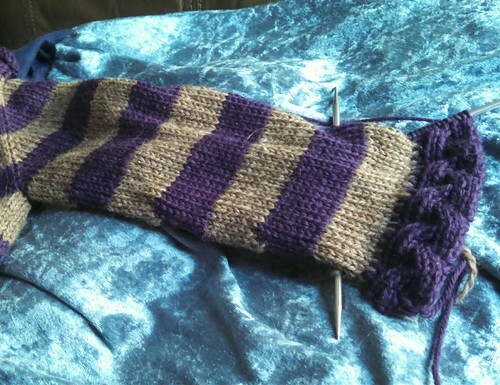 Corrugated ribbing looks SO BAD this way that I’m considering doing it again just so I can take pictures. Sounds like a decent blog post, right? *almost. I mean, I limped along in first gear to the daycare parking lot. But it was essentially dead. At least I didn’t have to push it the last 100 feet.